Ideal for multiple presenters, the PA419-02 has two wireless mic receivers and can even support a third presenter (with a wired mic) at the same time. The PA419-02 is the first PA made for use in schools and churches to feature Bluetooth & NFC (Near Field Communication) for quick and easy wireless audio streaming from a Bluetooth-enabled device. 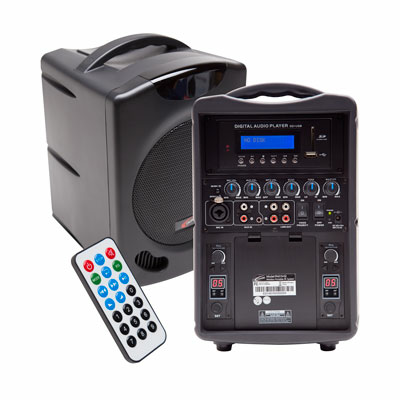 In addition to straight voice amplification out to groups up to 300 people (or in rooms up to 2,000 square feet), a computer (to the line input) or a projector (from the line out) can be quickly connected for multimedia presentations. With the voice priority of the PA419-02, making announcements through a connected microphone automatically mutes any music that’s being played. Three seconds after the speaking stops, the music will return to its previous level. The PA419-02 runs on AC power or its rechargeable lithium battery (20% lighter than lead-acid batteries), and plays for at least 2.5 hours on a single charge. The speaker comes with a choice of two or one handheld wireless mics, a hands-free beltpack transmitter with headset mic, or speaker only.